Did you know there is a proper dress code for riding a Jet Ski? Sure, a swimsuit is fine but it’s not everything you need. There is actually safety concerns when not wearing the correct jet ski riding gear and clothing. If you don’t believe me, then hop on your jet ski and read the owners manual or warning stickers. Let’s go through a little list of common things you should wear when you ride your watercraft. 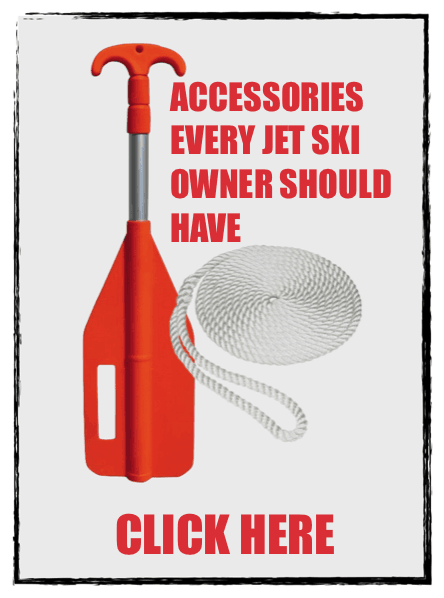 See the full list of jet ski accessories here. The most important thing you need to have on is a Life Jacket. It doesn’t matter if you’re a good swimmer or if you’re only going 2-feet over – If you’re on a Jet Ski you wear a life jacket! A life jacket will help you float if you fall off your jet ski. You’ll need the extra flotation because most people will panic especially if they have never fallen off a jet ski. Avoid falling off, it hurts! I’m not afraid to admit that I’m not the best swimmer in the world, but yet I still ride a jet ski. Whenever I go near my Sea Doo I put on my life jacket, no questions asked. What Size Do I Get? You don’t go by T-Shirt sizes when you buy a life jacket. You’ll want to go a size up. If you wear Large, then you’ll want an X-Large Life Jacket. Don’t panic or feel embarrassed as life jacket sizes are all over the place. When you get the life jacket, you want to try it on. The life jacket must buckle all belts or zip up all zippers. If you have to hold in your gut then you need a size up, don’t worry as you can tighten the belts on the jacket to fit your body. With the life jacket on and straps tighten you want to grab the bottom and try to lift up. A proper fit won’t allow the jacket to move much. If the jacket’s shoulders go above your head, then that jacket is too big. What this is doing is simulating what the jacket will do when you have it on in the water. If the first thing it does is go up above your head, then you’re not floating correctly and risk drowning. Once you have the life jacket, take it home or go somewhere that will allow you to test it out. Go in a shallow pool with someone there to assist you and try to float with the jacket on you. I know this sounds crazy, but it could save your life. You want the jacket to stay close to your body, and it should float you too. ***Always read and follow the instructions on the life jackets before using or trying them. How Often Do Life Jackets Last? Just like your shoes, life jackets wear out. The sun can get to them, and constant wear and tear can ruin them. I recommend replacing your Life Jackets Every 3 to 5 years. It’s a small price to pay for something that can save your life. What’s The Best Life Jacket To Buy? You should only buy Coast Guard Approved life jackets that are designed for Jet Skis. The life jacket I like is the O’Neill Wake Waterski Men’s Superlite USCG Vest. The biggest reason why I like it is that it has the place to hook your safety lanyard to on the bottom left (bottom right in picture). You have to hook the key to your life jacket in case you fall off the engine will shut off. Many life jackets don’t have this hook, so you have to wrap it around itself – its just easier to have the hook. Another great thing about this particular life jacket is that it’s more affordable than the ones you buy at the dealership. When buying many life jackets make sure you get different sizes so that you can properly fit life jackets to anyone that rides your watercraft. Wetsuit shorts are just as important as a good life jacket. Wearing your swimsuit is not sufficient – You need some type of Wetsuit Bottoms. I don’t want to go into details about why this is so important, so please refer to your owners manual or the warning stickers on your watercraft if you want to know more. The wetsuit bottoms you should buy is really up to the style and feel you want. Some are long; some are short. Some are warm, and some are crazy cozy! If you do any water sports like tubing, wake boarding, or skiing, then it would be very smart to have wetsuit shorts on. You can even get a full wetsuit so you can ride all year long! Many people like to wear flip-flops when they ride their Jet Ski. Flip flops are the worst thing you can wear when you’re blasting around on a watercraft. Your foot can slip so much easier when wearing flip flops. Flip flops also don’t offer complete protection of your foot. You never know what is under your foot when you beach your jet ski, it’s better to be safe than sorry. Having the correct water shoes on is such an important factor that I have a whole guide on it here. Probably. But blisters and sores around your thumb hurt a lot more than the fear of being a dork. I wear gloves every time I ride my jet ski, even have a picture of my gloves on the right. Why wear gloves? The answer is simple. When you hop on the watercraft, especially if you’re new, you will have a ‘death grip’ on it. Then you’ll hit some waves and bounce around. What you won’t realize until it’s late is that your wrist, thumb, and fingers have been bouncing around too and now you have blisters. Fingerless water gloves would have stopped that. The gloves will also help give you better grip too! 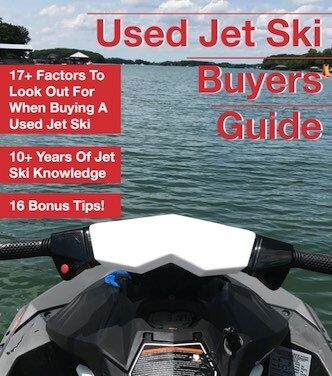 What Is The Best Jet Ski Gloves? Any fingerless riding gloves will work fine. The ones I bought are actually for kayaking, so that is fine too. If you need a recommendation then what I wear will be good enough. Click here to see the gloves I wear and the reviews on them. It gets extra bright from the water and the sky, so sunglasses are a must have. You might have sunglasses right now, but I recommend not wearing them. Chances are these are your favorite glasses, and you don’t want to lose them when riding your watercraft. I find the best sunglasses for a jet ski is ones you don’t mind losing and they also float. Floating sunglasses are a must, but don’t forget the floating eyeglass chain too! If you want to keep your jet ski clothing from getting wet, then you need a dry bag. I like having a dry bag that can fit most of my things like a towel in it. Also, having a dry bag for your phone is a must have too. To learn more about where to put your phone then check out my helpful guide here. I have a picture of the dry bag I used on the right. It’s one of those bags that have the clasp at the top, and you just fold it. You don’t have an actual seal, and I was worried as I thought there was no way this was waterproof. But I was wrong. When you fold it a couple of times and buckle it, it really does keep water out! Tip: keep a small towel or rag in your dry bag. You never know when you need it. If you’re going to be in the sun for extended periods, you need to put some sunscreen on. The best thing to do is buy a bunch and just keep it in the watercraft until you run out. But I hate wearing sunscreen! —- Me too! That is why I like to wear rash guards when I ride. The Rash Guard can keep some of the Sun off of you, but it doesn’t cover everything. So make sure to put sunscreen protection on the other places.